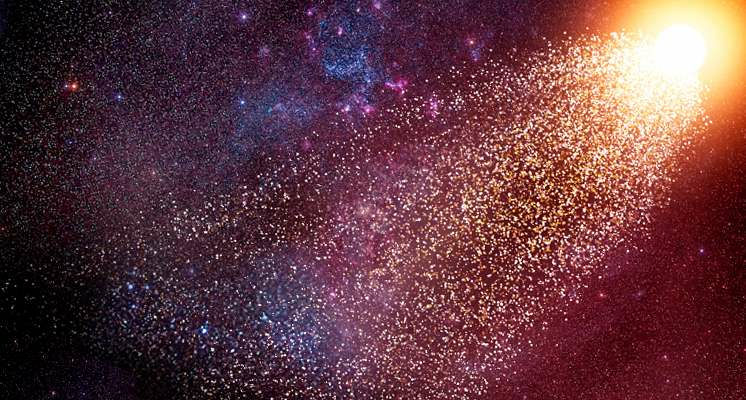 A group of astronomers have shown that the fastest-moving stars in our galaxy - which are travelling so fast that they can escape the Milky Way - are in fact runaways from a much smaller galaxy in orbit around our own. This number is not related to exceptions, especially because these stars are widespread from the center to the end of the galaxy. The same claim might have been made for the blue stars with 0.00003% of the total number of stars in our galaxy. It does not deny the claim that there exists move the star from the galaxy without rotation in a galaxy with rotation, but is not represented in such high numbers. Comets are no exception in our system. hitch a ride. We are wasting our time spining around our galixy. At frist I inveshioned a round space ship miles round but power heat was a problem. Then I though a planet moving to distant galizys but again there is this power problem. Now if you hitch a ride on a long lived red dwarf star or solar system. The ideal ride would be a black hole ride living at the edge of the event horizion where time stops or slows down to a crawl. We can have a few redundent mechanical systems to pull us out when we get close to somthing intresting or get int troble or get near to a galizys.